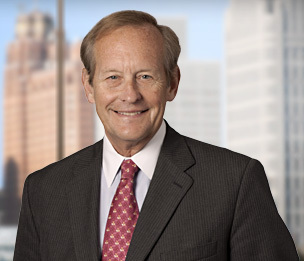 James P. Feeney, one of the nation's most prominent trial attorneys, regularly tackles high-profile, high-stakes litigation matters as a "go to" trial attorney for the world's largest companies. During the course of his nearly 50-year career, Mr. Feeney has been involved in more than 1500 cases, 70 of which he has tried to verdict. His experience includes trials of high-stakes matters for the automotive industry, financial institutions, media companies, real estate developers, and equipment leasing and insurance companies. The latter of these representations was particularly noteworthy inasmuch as it was a jurisdiction that the U.S. Chamber of Commerce has routinely ranked one of the most difficult in the United States. Mr. Feeney has successfully tried to defense verdict five state or nationwide class actions seeking billions of dollars in damages from the Firm’s clients. Clients quoted in Chambers USA note that he is a "bet-the-company lawyer" who is “very thorough and presents very well” in the courtroom. Mr. Feeney was the lead defense trial and appellate counsel in the notorious Jenny Jones case in which he successfully argued, on appeal, that plaintiffs' verdict ($25.0 million) had been improperly obtained. The verdict was vacated and judgment was entered for the defendant. Court TV, "The Today Show" and "Good Morning America" often call upon Mr. Feeney to provide commentary and insight on legal decisions, trends and case strategy. Mr. Feeney is a member of the American College of Trial Lawyers. Representation of original equipment manufacturers in a wide variety of commercial cases, seeking recovery for damages arising out of various contractual relationships. In the last several years these representations have resulted collectively in the recovery on behalf of Dykema clients in excess of 1 billion dollars in negotiated settlements. Representation of global manufacturers in defense of putative class actions alleging antitrust violations in the sale and re-sale of various products. Representation of foreign manufacturers in various disputes involving contract, fraud, statutory and tort theories arising out of the distribution of the manufacturers product in North America and EU markets. Representation of resort operators in defense of putative class actions alleging violations of common law fraud consumer protection statutes in the sale of memberships and management of various resort properties. Representation of resort operators in defense of putative class actions alleging ADA violations in the operation of various resort properties. Representation of publicly traded companies in putative class actions alleging fraud and breach of fiduciary duties under ERISA in stock drop cases. Defense of employers in a wide variety of tort cases alleging negligence, fraud, willful misconduct and vicarious liability seeking both economic and non-economic damages. Representation of automobile manufacturers in numerous personal injury lawsuits filed throughout the United States alleging a wide variety of product liability claims involving the design, manufacture and sale of passenger cars, light trucks, medium and heavy duty trucks. Representation of original equipment manufacturers in a wide variety of commercial cases, either defending or seeking recovery for damages arising out of various contractual relationships. Representation of individuals, partnerships and LLCs (and their members) in disputes alleging fraud, civil RICO, breach of fiduciary duty, breach of contract, securities violations arising out of the operation and/or failure of various commercial enterprises. Representation of various global businesses in international and domestic arbitration proceedings in a wide variety of commercial dispute. Service as a mediator/facilitator in alternative dispute resolution proceedings. Confidential arbitration hearing (participants names omitted), Lead counsel for respondent in 5 day arbitration hearing asserting breach of express and implied agreements arising out of the operation and administration of a joint venture. Three member Arbitration panel issued written opinion ruling in favor of respondent on all claims. March, 2018. Daniel et al v. Ford Motor Company, USDC (E.D. CA January 2018). Lead trial counsel for defense in 3 week jury trial of a class action on behalf of California purchasers of various model year Ford Focus. Claims asserted were based on theories of breach of express warranty, implied warranty and violations of the CLRA. Trial court had initially refused to certify a class and had dismissed the remaining individual claims. 9th circuit reversed, ordered certification and case proceeded to trial. Factual allegations asserted that alleged design defects in rear suspension geometry caused premature, uneven and excessive tire wear which raised safety concerns. Defense verdict on all claims. Oom v. The Michaels Companies, Inc. et al., 2017 U.S. Dist. LEXIS 112113 (W.D. Mich. July 19, 2017). Class allegations stricken in putative nationwide class action involving alleged deficiencies in provision of custom framing services. Lomax v. Ford Motor Co Salt Lake City, UT, July, 2014. Lead trial counsel in 3 week jury trial for defendant automobile manufacture sued for damages for catastrophic burn injures to 6 year old girl arising out of a rear impact involving a popular passenger car. Plaintiff asserted claims of negligence and strict liability involving the car’s fuel and vapor management system. Defense verdict. Westgate Ford Truck Sales, on Behalf of Itself and a Class of Ford Medium and Heavy Duty truck dealers vs. Ford Motor Company, Cuyahoga County Court of Common Pleas, Cleveland, Ohio. September, 2013. Lead trial counsel for defendant automobile manufacturer sued in a nationwide class action for $2.2B in damages, including interest, resulting from an alleged breach of contract caused by defendant’s failure to sell Company Products at published prices. The first trial (firm not involved) resulted in a $2.0B judgment, reversed on appeal. The retrial resulted in a jury verdict finding no breach. Barbie Nolte v. Ford Motor Company, Circuit Court, Jackson County, MO. Lead trial counsel for defendant automobile manufacturer sued for injuries to Plaintiffs resulting from a post-collision fire alleged to be the result of a defectively designed Crown Victoria Police Interceptor. Defense verdict. Linert v. Ford Motor Company, Mahoning County Court of Common Pleas July 2011, Youngstown, OH. Lead trial counsel for defendant automobile manufacturer sued for catastrophic thermal injuries to police officer due to an allegedly defective designed and manufactured police vehicle. Defense verdict. In the matter of Tam-Air, TAM and Williams International, International Court of Commercial Arbitration February, 2011, New York, NY. Lead trial counsel for claimant in commercial arbitration involving multimillion dollar claims of breach of contract and fraud arising out of sale of jet engines to a Georgian airframe manufacturer. Awaiting award. Weinstein et al v. Siemens PLM, f/k/a UGS, Inc. USDC ED MI, December, 2010, Detroit, MI. Lead trial counsel for employer defendant sued for $30M for 3 deaths on theories of vicarious liability and direct negligence arising out of a mid-day automobile accident caused by defendant's executive who left work one hour before accident and was alleged to be 4 times the legal limit at the time of the accident. Defense verdict. Godbee et al v. KIA Motors of America et al, Cobb County Superior Court, June 2010, Marietta GA. Lead trial counsel for defendant automobile manufacturer sued for wrongful death of female driver due to an alleged overly aggressive air bag. Defense verdict. Brown, et al v. Quicken Loans, October 2009, Wheeling, WV. Lead trial counsel for lender in consumer finance, fraud, Consumer Protection Act claims alleging predatory lending practices. Case submitted, awaiting opinion. Chrysler v. Hutchinson FTS, April 2009, Oakland County, MI. Lead trial counsel for automaker awarded $47.3 million jury verdict against Tier 1 supplier in warranty cost recovery action. Case settled without appeal. Konstantinov v. Findlay Ford, May 2008, Detroit, MI. Lead trial counsel for defendant auto dealer sued for $200 million for permanent brain/physical injuries by former professional hockey player and trainer for injuries occurring in automobile accident. Defense verdict, no appeal. Polowsky v. General Motors, September 2007, Pittsburgh, PA. Lead trial counsel for automaker sued for damages arising out of the death of plaintiff in a post-collision fire, product liability case. Defense verdict, no appeal. William v. Visteon, July 2007, Detroit, MI. Lead trial counsel for automobile manufacturer in warranty cost recovery action seeking recovery for warranty and recall costs from Tier 1 supplier. Confidential settlement reached during deliberations. Alexander, et al v. KIA Motors America, Inc., June 15, 2007, Orange County, CA. Lead trial counsel for defendant in consumer class action alleging defective seat belt design. Defense verdict. Newton Nolte v. Ford, June 2005, Kansas City, MO. Lead trial counsel for automobile manufacturer sued for damages arising out of a one fatality, one injury post-collision fire in high speed rear impact of police vehicle. Defense verdict. Jablonski v. Ford, April 2005, Madison County, IL. Lead trial counsel for automobile manufacturer sued for damages arising out of a one fatality, one injury post-collision fire in a high speed rear impact of a civilian vehicle. Plaintiff's verdict reversed on appeal. Judgment entered for Ford. St. Clair County, City of Centerville, et al v. Ford, October 2004, St. Clair County, IL. Lead trial counsel for automobile manufacturer in consumer class action on behalf of Illinois local units of government alleging defects in police vehicles. Defense verdict.